December 21 this year is Winter Solstice… 2:20 pm on Vancouver Island and in PST zone! This time of year the trees go into dormancy. FRUIT TREES are best pruned in this time, removing dead-diseased-dying branches, re-structuring, renovating. In the Victoria area, it seems January/February is ideal from what I’ve witnessed in the weather during my time here. I have been in Portland, Oregon recently and am once again impressed by their abundance of urban trees, and some large naturally structured ones at that. Portland is known for its’ progressive leadership in many facets of urbanism with respects to a better, healthier, urban environment…so of course it would make sense their trees and arboricultural practices are of good standard. I cannot say I have seen much evidence of wise and proper tree pruning, mainly due to my limited exploring, however in brief outings the specimens of trees and their natural stuctures are impressive. Their size as well. There are large deciduous trees lining downtown streets lurking under high-rises and over major roads. It seems Portland has realised that the right tree in the right place, left to grow naturally with minimal pruning…works well. I agree. This is one of my fundamental practices in my day to day pruning and tree work in Victoria. 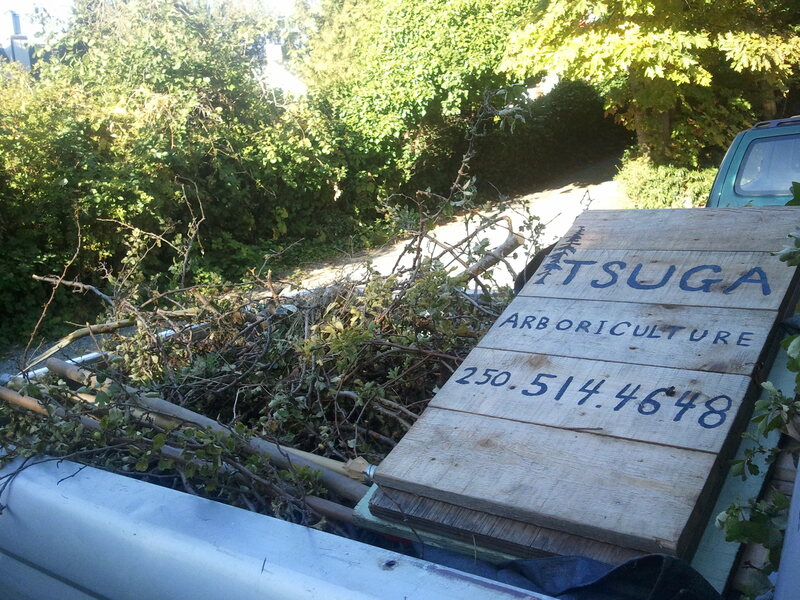 Minimal pruning means minimal future problems and maintenance, in most instances. Of course it depends on the situation, and “drop-crotch” pruning of entire limbs as opposed to many small cuts can be very beneficial. More to come on this type of pruning in my next post. Welcome to any ethicalDeal browsers. I will be running a deal with ethicalDeal for Victoria for the start of April. Feel free to contact me with any questions. I have been enjoying a growing friendship and partnership the last few years with Tayler Krawczyk of Hatchet & Seed Contracting. 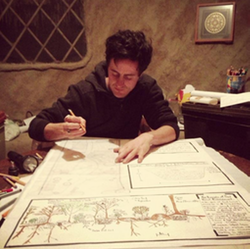 Specializing in bringing permaculture to your yard, progressive design and simple fundamentals are Tayler’s strengths. Although I enjoy trees and take convincing to remove them, I am always more willing to clear out undesirables to make way for food production. Of course there must be good reason to remove trees beyond a simple desire to grow food, but there are several such as a declining health, poor location, trivial species (insignificant), and poor structure/historical pruning. When stacked up with wishes for more sunlight, groundwater availability, and nutrient uptake for food, these reasons may lead to favoured tree removal(s)!! We will be teaming up on projects and making it happen. If you are looking to let the sun shine through and harvest your yard, bring us on-board! 2013 feels like a good year, I am excited. structuring One of my favorite practices when pruning a tree is to keep its’ established, or help to bring back its’ natural form. I believe in allowing trees to grow naturally as much as possible. Any pruning disrupts this flow, however if done appropriately, can have minimal impact with desired results. renovation Many trees have been pruned hard or improperly in the past. I enjoy trying to bring a tree back to form, eliminating poor growth/structure, cleaning out reactive growth (brought on by pruning and over-pruning historically), and with fruit trees… reducing height & overgrown shoots to bring canopy back down to reachable fruit-picking height. aesthetics Sometimes all it takes to make a tree look better than it does, are a few pruning cuts and/or branch removals. Taking a minimal approach while reducing unnatural and undesired reactive growth helps minimize future maintenance pruning. All of this being said, sometimes a tree needs alot of pruning! Which I am happy to assist in. Not all trees grow in spaces suitable for natural, expansive growth. Also, if a tree has been pruned in certain ways historically, it may be best to continue this style of maintenance. These next few months are a great time to prune before things start to grow on the ground below. Garden damage is most minimal this time of year. Thanks for reading, maybe see you soon. I had forgotten how nice it is this time of year with fresh foliage, blossoms, and growth. It’s safe to say all species are fully leafed-out and catching some rays for energy. I’ve been enjoying observing the different leaf explosions, exposing themselves for a summer season. Some species already have alot of growth, primarily with suckers. The winter moth (the little green guys with silk trails) are still around but I have been witnessing tent caterpillars everywhere. I have been combining physical removal of their lairs by pruning, and some spraying of Safer Insecticidal Soap (approved for organic use, made from naturally occurring plant oils and animal fats) and Spinosad (also approved for organic use). Word on the street is it may actually be beneficial to prune in the summer growing season over other seasons. I will be researching this topic and gaining evidence, but some of the arguments include better healing of wounds and less reaction growth by the tree in the future. I will post findings in the future months. The other day I was reminded how fast spring comes here on the coast. There are already signs of new growth, buds, and break-outs from the ground. If possible, this is still a great time…a window of opportunity… now diminishing, to get some clean-up pruning done before stuff really starts to grow and get into spring “fragile phase”. Winter gardens are much tougher at absorbing falling branches, wood chunks and foot traffic! The winter pruning post below sheds light on some potential for your trees this time of year.